We arrived at the pier at 11:50 AM to secure tickets for a 5:00PM trip of the Montenegro Shipping Lines bound for Romblon, Romblon. But,due to the strength of typhoon Emong which was all the way up in the Northern part of the country, no vessels were allowed to leave and we had no choice but to wait at the pier. We finally left at 2:00AM of May 8. During the 14-hour waiting period, we were able to talk to a lot of different people who were traveling to Mindoro and other parts of Romblon, which made it more bearable. We even met the humble owner of Conquer, that famous local outdoor shop in Rob Pioneer who was traveling to Tablas with his wife for a vacation. Note to Mountaineers: If you are planning to bring Buthane canisters, you have to coordinate with the shipping lines in advance. In our case, we weren’t able to secure permits in advance so one of us just negotiated (in a very nice, seductive manner –hahaha) with one of the officers of Montenegro and they escorted her in when it was boarding time. On Board MV Helena I dislike long boat rides but since there were no other options, we just had to focus on making it a positive experience by amusing ourselves with each other. That doesn’t sound good. What I meant was, we amused ourselves with each other’s antics and stories. We slept for a few hours and by 7am I was already awake and very hungry but I didn’t feel like leaving my bunk yet. I looked at my friends to see if anyone was up but I only saw Milmar who was near the deck watching the waves while talking to this other guy. The guy, well, that’s what I thought he was the first time I saw him – given his bulky, muscular frame but he seemed to be looking at Milmar quite strangely. I could practically see stars in his eyes as he gave us travel information. Hahaha! I had to interrupt him twice to get Milmar off the hook so we can eat breakfast. After our meal, we went back to chat with our other friends and we bonded some more by sharing childhood bloopers with each other. We had a great laugh over each other’s strange experiences. *There isn’t a lot of food options on board – mostly chips and cup noodles, priced quite high – 35 pesos for the cup noodles (the standard size you find in local groceries), 70 pesos for the microwaveable food cartons (70- pesos each); I suggest you bring your own food. We arrived a little before 2:00pm and we had to rush to the other side of the pier bound for Sibuyan Island which was another 2-hour boat ride from the island of Romblon. There are direct trips to Magdiwang coming from Batangas pier but the schedule isn’t on a daily basis. 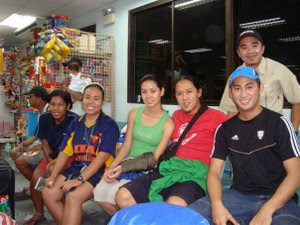 It was around 4:30pm when we arrived in sir Toto’s place via a tricycle from the port. Sir Toto is the most famous and reputable guide for Mt Guiting-Guiting. We stayed with him for the night and we unloaded some of our stuff at his place – a humble home with a nice, clean river across it. He took us to the shore in the afternoon while Jayz and Manny secured permits at the DENR which is about 45 minutes away from the pier by tricycle. We also ran into an ati-atihan practice for the festivities, which was during the week we were there. We had our little socials after dinner and capped the night early so we can get a good night’s rest prior to our climb the following morning. Wake up call was at 5:00AM and by 7:00AM, after well wishes from Sir Toto, we set off for Mayo’s Peak, where we were scheduled to spend the night. He recommended one porter and one guide since he couldn’t accompany us due to his high blood pressure. The trail from Sir Toto’s place up to the first water source – a clean river overflowing with cold water was easy and relaxing. After that, I felt my body giving up, like something had sucked the energy out of me. I knew I wasn’t tired yet. For some weird reason, after we crossed that river, I had no energy left. I had to tell the group to stop for a rest. I spoke with Rhovee and told her how weak I felt. I knew in my mind that I could go farther but then my body wasn’t cooperating. Rhovee initiated a regrouping and this time, the pace became more manageable for me. We finally arrived at 6:11PM in Mayo’s Peak. We hugged each other as we accomplished the first phase of our journey. 7:30AM – there was mild precipitation when we started our ascent from the camp after a short but meaningful prayer led by Manny. We left the decision-making to our experienced guides whether to proceed or abort. They suggested that we climb as far as the weather will permit. Our camp was 5 minutes away from Mayo’s peak – where you can already see a lot of wonderful views of the ocean and the towns below you. The trail after Mayo’s Peak became more difficult with each step and involved a lot of bouldering. The rain poured a little stronger and some of us got worried. We still had to pass a Knife Ridge – aptly called as such due to the narrow trail with cliffs on both sides. Any misstep will send you down a deep gorge and only God knows how your body can be retrieved. The rain stopped after about an hour or so and we were treated with salivating views of mother nature in action. The rain caused the formation of waterfalls cascading down the slopes of Mt. Guiting-Guiting. According to Manny and Milmar, the scene was reminiscent of what can be seen in the movie, the Lost World. Several times, I stopped to admire the view. I couldn’t hold back the smile that escaped from my lips. Three hours later, my energy is drained, each step becomes heavier and I feel every inch of my body fats working against me. I vowed to lose weight. Milmar was in front of me and was kind enough to help me out. You see, this mountain works well for those people with longer limbs. My short, stout legs were working double time and I had to push myself harder to advance to the other boulders. 12:30PM – The first batch of our group finally reached the summit of Mt. Guiting-Guiting. Thirty minutes later, a smiling, scratched and bruised version of me followed the rest of the group with Manny and Milmar who refused to leave me behind. We didn’t stay long at the summit. After Jayz and Milmar shed tears of joy and after eveyone ate lunch, joked around, took pictures and rested a bit, we made our way back to camp. There is an ideal turn-around time so you can get safely back to your campsite. It was supposed to be at 1:00PM but since someone who looked a lot like me was moving a bit slower than intended, we were able to depart the summit at 2:00PM. Night began to fall as we made our way to the knife ridge. Me and Rhovee had a girl talk while trekking the dangerous ridge. Somehow, it helped ease our fatigued body. Actually, about two hours after we started our descent, my body has ceased producing energy and only my persevering mind was working in full force to command my feet and arms to move. Several hours of exhaustive bouldering later, we got back to our camp. It was past 7:00PM and again, we hugged each other for a successful return back to Mayo’s peak. The trek down was more forgiving and after we reached camp 3, the rest of the trail became easier despite the mud. This time around, I took time to enjoy the trek and for several minutes, I find myself alone in the trail. I did some thinking, as what I often do when I’m alone. 45 minutes before we arrived at Sir Toto’s place where we were to spend another night, we reached a river with clear, cold water. No one could resist the temptation of taking a little dip especially Milmar who has seen a river only twice in his life. It wasn’t after two hours later when we finally bid good bye to that beautiful river. As we began our trek back to the barangay, we were welcomed with warm smiles from the locals, some of them even congratulated us. Since little me was trailing behind by several meters, filled with bruises and lacerations, I got the most attention. Everyone were pointing at me as if I had two heads and so I ran to the rest of the group to camouflage myself. We arrived at Sir Toto’s place with proud smiles, and severely aching joints but the beauty of the mountain we had witnessed made all the pain worth it. Several hours later, we had our little feast by the beach of fresh sea foods – Lapu-lapu and some other exotic fishes. Yum yum! Due to the excitement of conquering the summit of Mt. Guiting-Guiting, we had forgotten to secure return tickets back to Batangas Pier. Since there was an on-going fiesta celebration, though it was a Tuesday, all the tickets were sold out and we were left at the mercy of the Coast guards. Apparently, you’d have to seek their permission for you to board the ship to prevent overloading, which is a good thing. Sir Toto was kind enough to do the talking in behalf of our group. Fortunately, the Coast Guard permitted us to board but the catch was, we had no beddings. Our group of five had to appease ourselves with the little space we were able to secure near the front of the cafeteria. We sat in a 3 x 5 ft tarpaulin surrounded by our bags which served as our perimeter fence – for 11 hours, occasionally standing up to get some air. 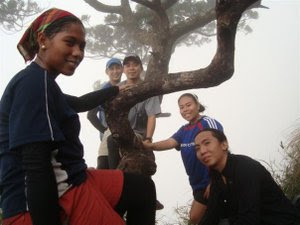 Rhovee, who often takes part in adventure races, suggested the formation. Throughout the uneventful trip, we tried to entertain ourselves with stories of funny experiences during the climb, practicing knot tying and this board game called dama created by Milmar. The group discovered that Manny was a natural at it. We arrived back at the Batangas Pier at past 1am. We proceeded with our post climb after eating our late dinner. Almost everyone said the same thing : that they had a great time despite all the challenges we faced : getting stranded at the port, harsh weather, over 6 hours of bouldering, exigent terrain, fatigue, boredom. Personally, I emerged from this experience an even stronger person and filled with pride over this simple achievement. Looking back, I realized that I haven’t conquered Mt. Guiting-guiting, rather, I was conquered with awe for its beauty. This mountain reminds me so much of life – filled with challenges but along the way you will encounter a lot of wonderful things that makes the journey all worth it. Boat : Batangas to Romblon - 619 pesos (via Montenegro Shipping Lines – Economy). They don’t have cabins so you just have to rough it up.